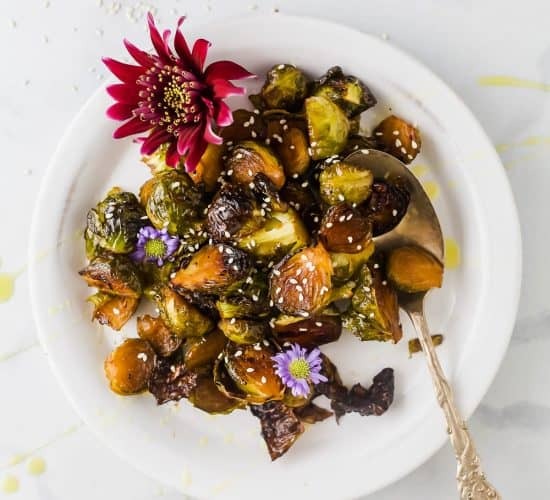 Asparagus & Brussel Sprout Salad topped with Honey Dijon Dressing – a tasty, healthy, easy to make salad done in 30 minutes that’s sure to be a favorite! Perfect for the holidays or a fresh start to the new year at only 162 calories a serving! We have officially almost made it to the end of the year! And let me tell you, I know my tummy will be happy to have this year end. It is stuffed to the brim and my parents haven’t even come yet! (guess I need to lay off the Christmas cookies … hehe) Have you noticed the year always seems to start off great you’re eating super healthy, then the summer comes around and everything is delicious with loads of fresh fruit, salads, and all things grilled … and then the fall happens. Oh the fall … Everything comfort food, soups, stews, sweets, treats, and cocktails! We do it every year, and you know what I wouldn’t have it any other way. Now, I’m gonna assume that since today is December 23 most of you sweet people already have your Christmas Menu planned and based on how the grocery store looked today (I had to drive around for 5 minutes looking for a parking spot at the grocery store, ridiculous … ), maybe even have all the food for said menu purchased as well! However, if you’re not in that category of “uber organized” let me throw one more holiday side dish at you! 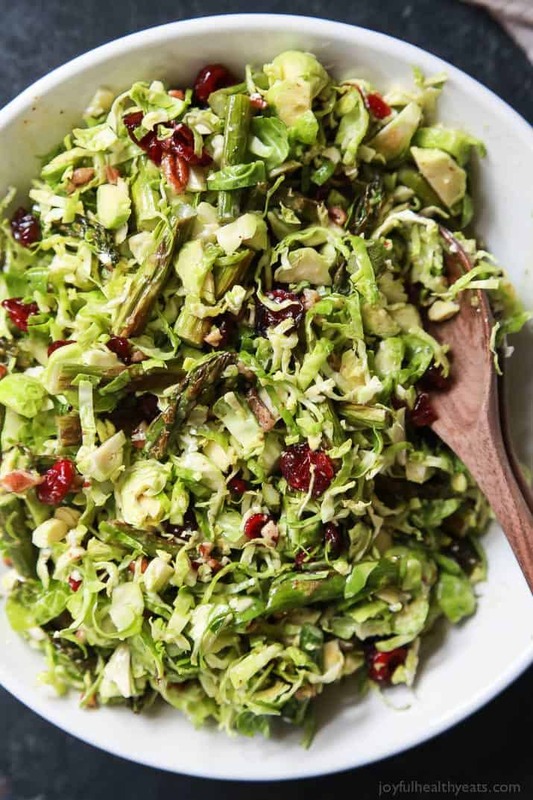 This Asparagus & Brussel Sprout Salad with a Honey Dijon Dressing! Ohhhhh Ahhhhh!!! This Salad basically has all of my favorite things … brussels sprouts, asparagus, goat cheese, and a homemade honey dijon dressing!! I can’t get enough of my honey dijon combo, sweet and tangy is the way to go always! I literally have made this salad twice in the past two weeks and have devoured it myself over several days! I am addicted, no questions asked. 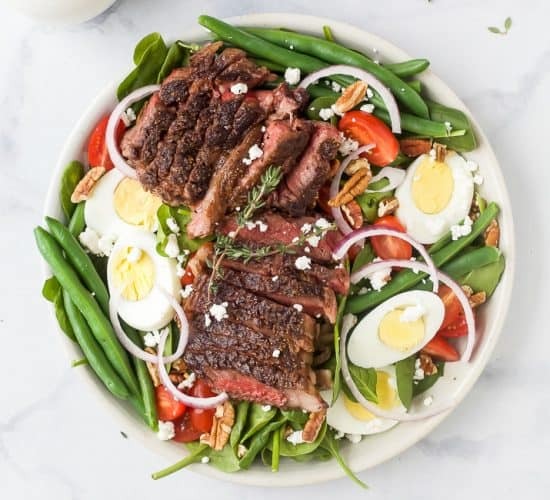 It is great served cold the next day BUT I prefer it fresh when the asparagus is warm and added to the salad because the warmth of the asparagus melts the goat cheese a little bit for one killer bite! 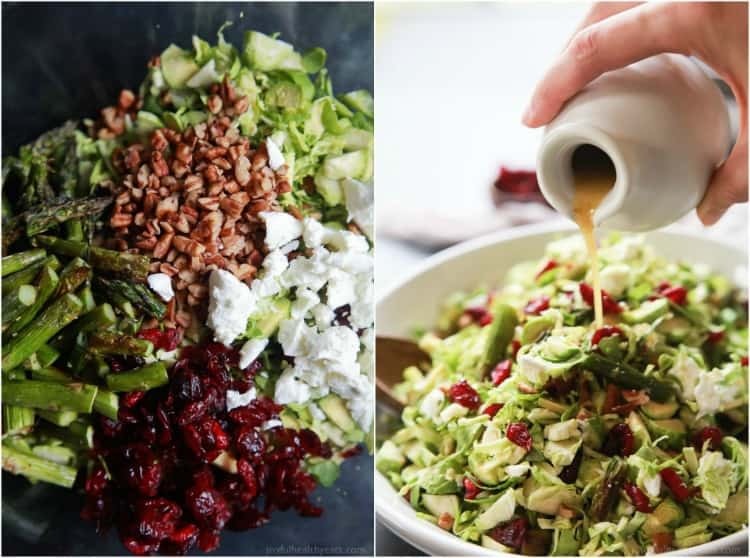 Even though I’m giving this salad to you for a holiday side dish, it can easily be thrown into the mix of healthy salad options for the New Year at only 162 calories a serving, even if you double the portion – which I do – it’s still only 342 calories! Woot Woot! 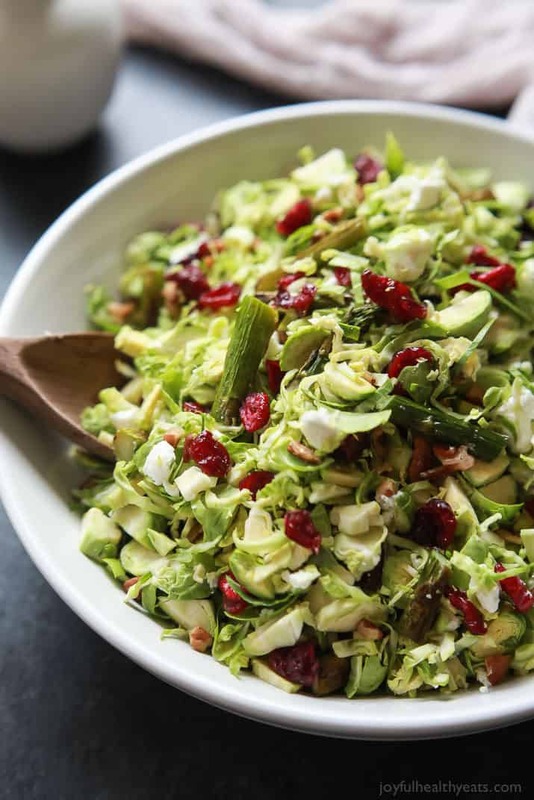 Brussel Sprout Salads have become a favorite of mine. I usually buy sprouts instead of kale now just because I love the flavor and the finely chopped pieces. Everything tastes better when it is chopped up nice and small, don’t you think!? 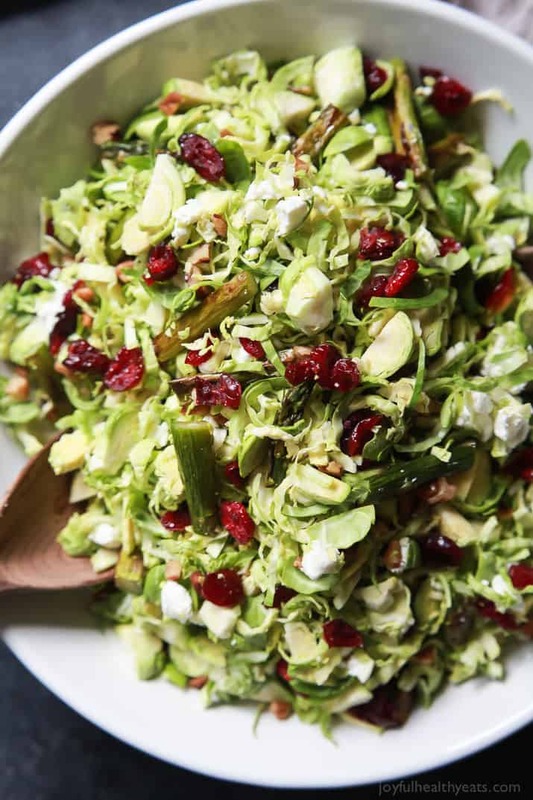 The only part that can get a little tedious about this salad is shaving the sprouts, but once you get in the groove you’ll be done before you know it! I hope you enjoy this salad as much as I do, it may hurt a little if you don’t because I am obsessed with this salad! On a side note, what kind of recipes are you guys looking to see for the new year? Smoothies? Salads? 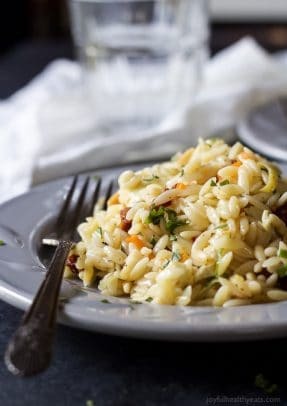 Lightened up Main Dishes? Snacks? I hope you have a Merry Christmas with your family! Muah! Add the prepared asparagus to baking sheet. Season with 1 tablespoon of olive oil and 1/2 teaspoon of sea salt. Toss to coat. Spread asparagus out on baking sheet into a single layer. Bake for 15 minutes. 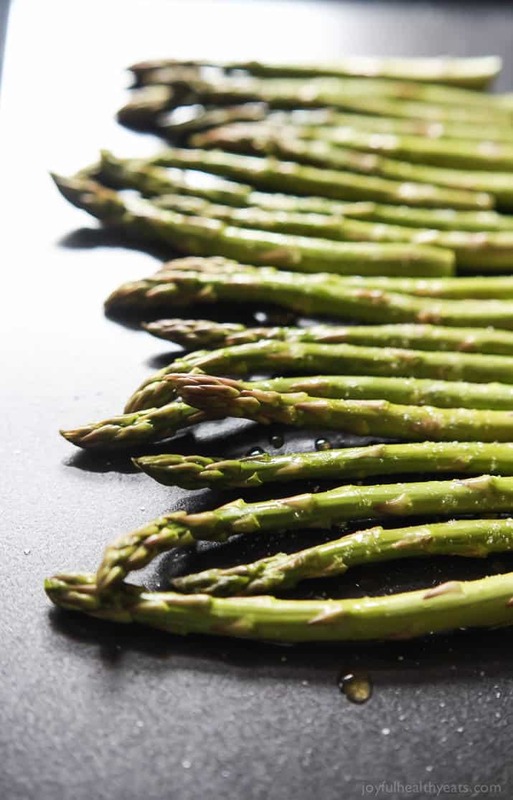 Remove and cut asparagus into 2″ sticks. Set aside. 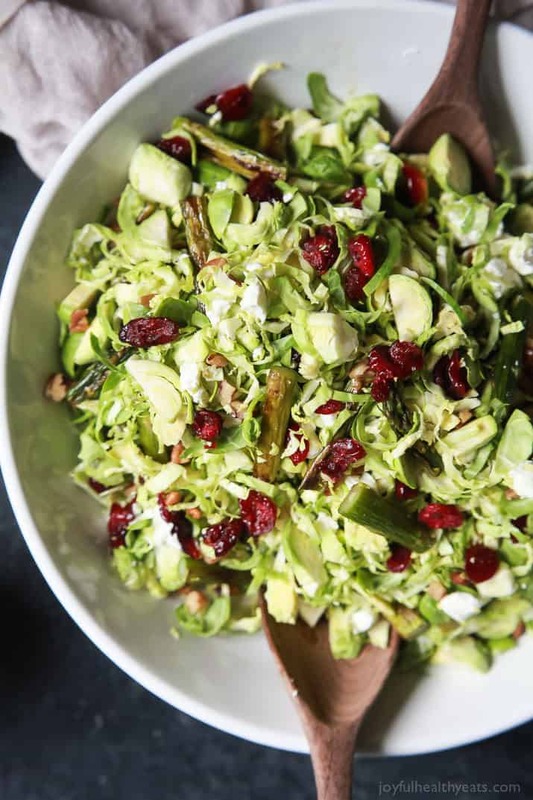 To a large bowl add shaved brussel sprouts, cranberries, pecan pieces, goat cheese, and asparagus. In a small bowl, add stone ground mustard, white balsamic vinegar, remaining olive oil, raw honey, and salt and pepper to taste. Whisk until oil and vinegar are no longer separated. Add dressing to the salad, toss to coat everything and serve. To shave brussel sprouts: Trim the end off the sprout then slice the brussel sprout in half. Place the flat side of the brussel sprout on the cutting board and then thinly slice the brussel sprout. I’m loving everything about this salad, what a fabulous combination of flavors and ingredients, seriously can’t wait to try it! Hurray! Can’t wait to hear what you think! 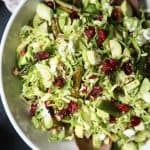 Always looking for creative ways to use Brussell sprouts and this salad sounds like a definite winner. Pinned! Thanks Eric! You’ll love it! 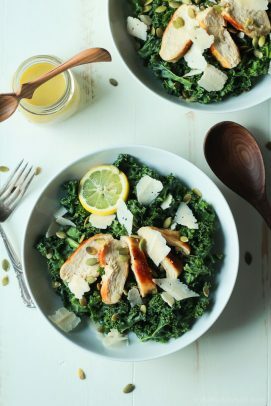 This sounds amazing and a nice light and healthy alternative to all the heavy holiday food! Thanks Megan, it is perfect! This salad is truly lovely! While my Christmas menu is planned, my husband and I usually have a 2-person Christmas dinner after and *that* menu is still up in the air. Gonna show this to my boo and see what he thinks! Ohhh… love that you have a two person dinner afterwards.. that’s so smart and special! We need to start doing that! We are two peas in a pod. I could eat asparagus and brussels sprouts everyday! We had a great Christmas and holiday season, I hope your family did too Kelly! Hugs! This is PERFECTION. Seriously. Beautiful!! Yes please. The more veggies the better. Love the ones that you picked. Great looking salad!! Thank you so much girl! Hope you get a chance to try it! Dang – 2 of my favorite veggies with my (quite possibly) my favorite sauce/dressing. Definitely going to try this and report back. Thank you Krista! woohoo! it’s a gem of a salad that is for sure! enjoy jeff! 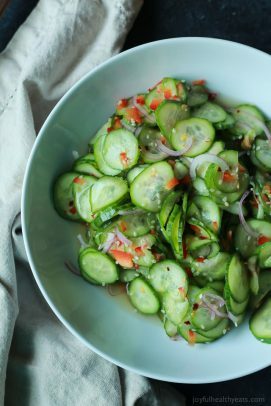 this is a beautiful salad, and so fresh! loving that vinaigrette especially.. i think i will be making it! Thank you so much Thalia! It’s one of my favorites!